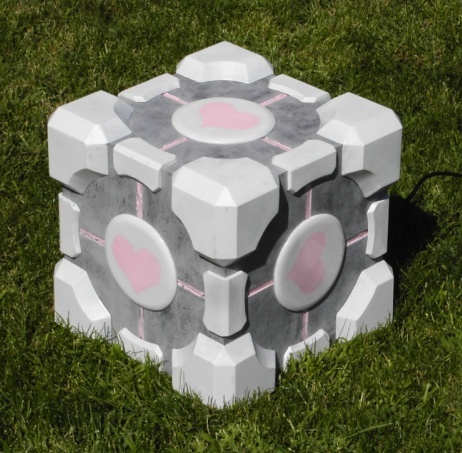 The game Portal has motivated modders all over to recreate the Weighted Companion Cube and make it functional within their lives. Well the latest modder, d_stilgar, decided to create the Companion Cube and slip a subwoofer into it. Which would make your PC all the more geek friendly. He is also working on two speakers that will also be Portal inspired to go with the subwoofer. Hopefully he’ll get that project finished and posted soon. Although don’t be surprised if you don’t see anything about them for a little while. Apparently the subwoofer took several months for him to complete. So odds are it’s going to take several more months to create the speakers. Sadly, he’s not giving even the slightest teasing hint as to what the speakers will look like either. The subwoofer weighs 40 lbs and features pink EL lights. The EL lights begin to glow brightly like in the game once the lights are shut off. Thankfully, if you’re interested in trying out this mod yourself you can go to his site and see all the details on how this was created.